This book was published earlier this year (2015). It was written by an experienced social worker who works for an organisation called AdoptionPlus in the Coventry area. The book is subtitled “Everything Adopting Parents Need to Know about Preparations, Introductions and the First Few Weeks”. Tl;Dr: this is a good, fairly short read that could be very useful for potential adoptive parents. 8/10. The book is organised into 8 chapters. In each chapter, text (the theory) is interspersed with related anecdotes. I quite like this structure, as it helps me think about applying the theory to potential situations. The first two chapters are theory-heavy — they deal with attachment theory and child brain development. There’s nothing new here, based on the various books I’ve read and the adoption training I’ve had. But it’s well done and as I mentioned above, interspersed with anecdotes. The next two chapters are on preparing yourself then your family. Much of the personal preparation, of course, you’ll already have done if you’re currently doing an adoption home study. The information presented on preparing friends and family is useful. It could be particularly helpful if you have ohter children at home who will be affected by bringing in a new child. Another key topic is explaining to close friends/family about therapeutic parenting — you won’t be parenting your adopted child like they parented their birth chidlren. 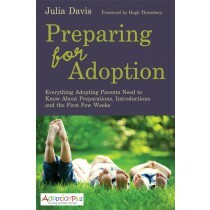 Chapter five talkes about how children are prepared for adoption. This is where I thought the books become really interested, as it wasn’t something that I’ve learned about in any detail elsewhere. Introductions are covered in chapter six. It explains the structure of introductions. I’ve read a bit about introductions in An Adoption Diary (Maria James) but it seems like they’ve changed a bit since that book was written. The next chapter is about attachment-based parenting. It is full of some practical steps and ways to interact with adopted children. The final chapter very briefly identifies some times when there might be particular emotional triggers in children (bedtimes, etc). It talks about the emotional issues that an adoptive parent can struggle with after placement. Overall, this is a very good book. It’s not too long, it’s not too theoretical, it’s not to lightweight and it’s not too deep. Just right. I strongly recommend this book as part of your adoption preparation.